More than one tribute honoring Sam Shepard, the influential American playwright and actor who died at his Kentucky home on Thursday at 73, has pointed to the iconic image of his rangy figure clad in a bomber jacket, ambling away unfazed from a near-fatal crash in his Oscar-nominated role as test pilot Chuck Yeager in Philip Kaufman’s 1983 film The Right Stuff. Shepard’s loose cowboy swagger, his easy masculinity and his rejection of conventional heroism were stamped all over that memorable performance, along with his laconic heartland manner and piercing directness. But for me, the film role most emblematic of this taciturn neo-Gary Cooper was his first major screen appearance, as the wealthy Texas Panhandle farmer drawn into a deadly romantic triangle in Terrence Malick’s haunting 1978 evocation of early 20th-century American life, Days of Heaven. In that film, Shepard’s unnamed character confronts his mortality while falling in love with an itinerant worker. He then watches with gimlet-eyed intensity as the deceit behind their marriage is exposed, his anger given cataclysmic weight by the operatic forces of plague and fire that destroy his crops. While the celebrated visuals of that film evoke the painters Andrew Wyeth and Edward Hopper, its magic-hour shots of Shepard amid sprawling wheat fields — a solitary figure with an unforgiving gaze — could just as well be lifted from the playwright’s own singular body of work. No other dramatist before or since has crafted such distinctive, richly textured contemplations of the American West, or of the broken dreams and fractured families that have littered its devolution. The landscape that will endure in Shepard’s greatest plays is a desolate prairie of the mind, a dark place of bitter betrayals, corrosive lies and scalding disillusionments, captured in language that ranged from off-kilter naturalism to surreal lyricism and caustic black humor, and in action notable for its frequent eruptions of bruising physicality. Shepard’s most lacerating portrait of the breakdown in family values, and, in particular, the illusory authority of the traditional patriarch, was perhaps his 1979 Pulitzer Prize winner Buried Child, which was recently revived in New York and London with Ed Harris and Amy Madigan. 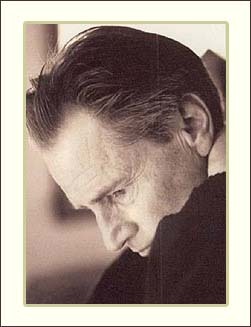 But family, and the irreconcilable frictions and abuses, the disloyalties and rivalries that feed its dysfunction, was a core theme in many of his best-known works of the 1970s and ’80s, among them Curse of the Starving Class, True West, Fool for Love and the under-appreciated, messy masterpiece A Lie of the Mind. Last seen in New York in a searing 2010 production directed by Ethan Hawke, that 1985 drama about two irrevocably damaged Montana families was the culmination of a defining thematic exploration and arguably its most powerful expression. No American playwright since Eugene O’Neill had so mercilessly stripped away the consoling notions of familial and romantic love and security to reveal the festering resentments beneath those false comforts. In Shepard’s work, rootless sons are fated to become the fathers they hate; siblings are divided, often indistinguishably, into good and irredeemable selves; women feed on their victimhood while clinging to the false salvation of their marriages; and helpless, hopeless old men refuse to die. The seeds of that focus could be traced to Shepard’s personal history, to his conflicted relationship with his father, a former bomber pilot who became a chronic drinker. Echoes of that overarching theme run through his finest work as a screenwriter, too, on Wim Wenders’ 1984 road movie, Paris, Texas, which Shepard co-wrote with L.M. Kit Carson. Harry Dean Stanton, in a key career role, played an amnesiac drifting in from the desert to reconnect with his brother and his seven-year-old son, eventually embarking on a journey with the boy to find his missing mother. The seamless blend of physical and psychological terrain, as well as the contradictory expansiveness and bleakness of the American landscape, are classic Shepard. That this rancher poet who emerged out of the off-off-Broadway theater scene of the 1960s (one of his early experimental plays was Cowboy Mouth, written with then-girlfriend Patti Smith) should also have become a reluctant movie star was perhaps the ultimate irony of Shepard’s long and prolific career. Those blurred boundaries between persona and performance, role and reality, are part of what made Shepard such a compelling presence onscreen — even though his every appearance was so understated it seemed almost antithetical to what we consider great acting. His face always told a story, even more so in his later, craggier years. His single scene as the suicidal alcoholic poet in the otherwise patchy 2013 screen version of Tracy Letts’ great play, August: Osage County, was the film’s one moment of lingering emotional impact — far more arresting than all the showy histrionics of Meryl Streep and Julia Roberts combined. Several directors in recent years have harnessed Shepard’s subdued charisma, his unforced gravitas and the weathered roadmap of life experience etched across his face to strong effect. Among them are Ridley Scott in Black Hawk Down, Andrew Dominik in The Assassination of Jesse James by the Coward Robert Ford, Jim Mickle in Cold in July and Jeff Nichols in Mud and Midnight Special. And how fitting that one of his final roles was as the flawed patriarch in Netflix’s Bloodline, playing opposite Sissy Spacek as a couple who seemed carved out of the vintage Americana mold. Shepard’s writing and performances will live on as reminders of a lost frontier, and of a uniquely American family portrait enriched by the eternal warring coexistence of darkness and light.